This is a review of the product Optimal Solutions by Nature’s Bounty. 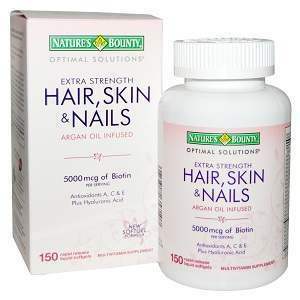 The manufacturer claims that this product has a perfect balance of nutrients that can provide lustrous hair, enviable skin as well as strong nails. Read on, to know more about its ingredients as well as our opinion of whether it is the right product to take for the health of your hair, nails and skin. It is recommended that adults take three capsules of this product daily, preferably with a meal. This product is not intended to be used by any person under the age of eighteen as it can lead to an overdose of products containing iron. If you are allergic to yeast then you should avoid this product at all cost. In case of an accidental overdose or an allergic reaction to any of the ingredient in the product, you should contact a doctor or a poison control center immediately. The manufacturer has not listed the price of this product on their website. This can be really frustrating for the consumers as they would now have to search the internet to ascertain if the product is within their budget. This product is available on Amazon at a price of $10.63. The manufacturer of this product does not offer any kind of guarantee and this is an area of concern because if you are not satisfied with the product and if it doesn’t show the desired result then you have no way of getting your money back. The product only has a few reviews which are mostly negative and makes it a questionable purchase. Optimal Solution by Nature’s Bounty is composed of vital nutrients that can not only help us look good but also feel good. It can improve the health of our skin, hair and nails but it is not a vegetarian product as it contains gelatin. Even though the manufacturer claims that it doesn’t contain any kinds of artificial preservatives, sweeteners or flavors but it contains artificial colors in the form of Carmine Color, Silica, Mica and Titanium Dioxide color and as a result is not suitable for vegans and vegetarians. In addition to this the manufacturer has not provided any kind of money back guarantee which makes it difficult to recommend this product. John Brownstone	reviewed Nature’s Bounty Optimal Solutions	on July 29th	 and gave it a rating of 2.5.